Tulku Orgyen Phuntsok was born in Pemakö, in northeastern India, as the son of Lama Rigdzin Phuntsok. He was recognized at a young age by Dudjom Rinpoche as the reincarnation of Togden Kunzang Longrol, his father’s root guru. Togden Kunzang Longrol was a great Dzogchen yogi from the Powo region who had been a main disciple of Dudjom Rinpoche, and who had been influential in spreading the dharma and the Dudjom Tersar lineage both in Tibet and in upper and lower Pemakö. Tulku Orgyen Phuntsok spent his early years in retreat in Pemakö, at his own monastery, under the blessings of his first root teacher, the great master Tulku Dawa Rinpoche. Tulku Orgyen Phuntsok underwent vigorous training in multiple fields of study, including various ritual sadhana performances from different terma lineages, with an emphasis on the Dudjom Tersar lineage, all under the care of his previous incarnation’s disciples, including his father Lama Rigzin Phuntsok. Upon completion of his studies at Namdroling monastery, Tulku Orgyen Phuntsok returned to his retreat land in Pemakö, where he engaged in solitary retreat and completed the requisite practices to become a qualified Vajra master in this lineage. 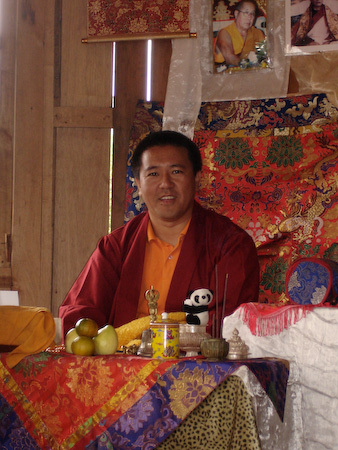 Since late 1999, Tulku Orgyen Phuntsok has assisted his uncle and teacher, Bhakha Tulku Rinpoche, by giving teachings, leading practices and retreats, and undertaking various other Dharma activities at Vairotsana Foundation Centers in California and New Mexico and in various cities in North America and Asia. In order to gain a western education and perspective, Tulku Orgyen studied and guest lectured at the University of California, Santa Barbara. Currently, Tulku Orgyen Phuntsok splits his time between North America and Asia, spending winters in Pemakö where he oversees reconstruction of the temple. This page was last edited on 13 February 2018, at 21:47.